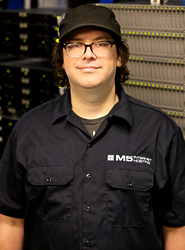 We have been working with M5 Hosting since 2008 and one of the things that really impressed me was (a) their awesome support level for FreeBSD, and (b) that there was real people with first and last names that you get to know over time and take responsibility for their company. Hey, there. We’re your M5 team. Nice to meet you. We’re a fun-loving bunch that works hard and plays hard. Learn more about us below or just pick up the phone. It’s actually us on the other end. OK, except maybe for Roxy. Then: Telecom and Internet Systems Integration, Data Center facility deployment and operations, Unix and Linux systems admin, network engineering. Now: I make sure we have the best people and resources to make our customers happy. Favorite thing about M5: Listening to our customers, adding our experience, and helping build useful infrastructure for them. Fun fact about me: I can quote an embarrassing amount of Monty Python movies and The Princess Bride. Outside of work you’ll find me: Enjoying the product of San Diego’s microbrewery scene; getting involved in San Diego’s Startup scene. Then: Graduated San Diego State University, extensive background in branding, sales, and marketing. Work experience includes roles at Apple Computers, VQ ActionCare, Fox Racing Shox, AirDrives, and Specialized Bicycles. Now: I am high energy with serious attention to detail and a vision of how M5 will service our current and future clients. Favorite thing about M5: What I really appreciate about M5 is the amazing transparency from owner to staff and company to client. Fun fact about me: I can’t sit still. My free time is full of motion, whether on motorcycles or skateboards or hiking a mountain. At night I can be found working on mechanical things and I require minimal sleep. Outside of work you’ll find me: I am all about doing things with my wife and two boys. We love riding dirt bikes and camping in the desert. Then: Graduated Rollings College, Winter Park FL. 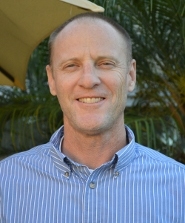 An information systems professional with 26 years in-depth experience in all aspects of enterprise IT operations. 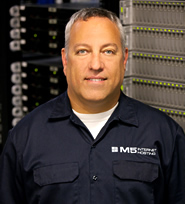 Jimmy comes to M5 after 20 years at SAIC and with a wide range of experience including: technical support, software development, 7/24 IT operations management and business development. 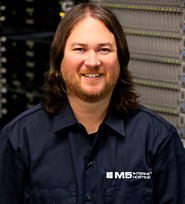 Favorite thing about M5: What I really appreciate about M5 is the team’s dedication to providing the best customer support in the industry. Fun fact about me: I am a mechanically minded person who enjoys getting dirty and trying my hand at new things. Outside of work you’ll find me: Racing sailboats of all sizes, gardening or restoring cars. With M5 Since: Consulting since 2008 and full time since 2015. Then: Graduated from San Diego State University with Distinction. 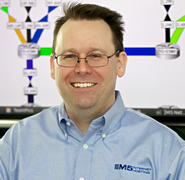 Prior to joining M5 full time, I served as an IP Network Consultant for various firms specializing in large scale network implementations and migrations. 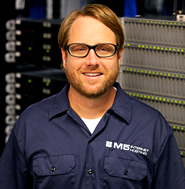 Now: I manage the engineering team while continually expanding my technical skill set. Favorite thing about M5: Learning from co-workers. Fun fact about me: Probably one of the last U.S. citizens to be born in Iran. Outside of work you’ll find me: Attempting to maintain sanity while raising five children. Then: Prior to M5, I served as a Sr. Network, Systems, and Automation Engineer for several Fortune 500 companies (Intuit, Booz Allen Hamilton, & Qualcomm). Now: Architecting new processes at M5 for infrastructure integrity and integrating applications and systems to grow M5 into a fully dynamic, reflexive, agile, and interlinked enterprise. Favorite thing about M5: The collaboration and teamwork is a huge bonus with everybody willing to lend a hand. My other favorite thing is the lack of unnecessary artificial political barriers. Fun fact about me: My first car was a 1950 Chevy that I used to run at Bandimere National Speedway back in high school. Outside of work you’ll find me: Guitar-slingin’ in local bands around SoCal. I’ve been addicted to the sound of 6 electrified strings since I first heard ZZ Top when I was 7 years old. 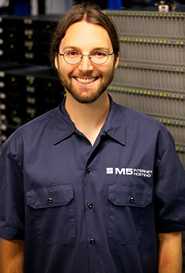 Then: Prior to M5 I worked as a Systems Analyst and before that as a Unix Systems Administrator. I also earned a Masters in bioinformatics. 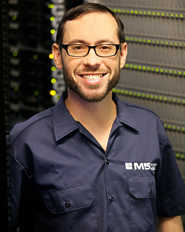 Now: Applying my expertise to help make M5 even more awesome at delivering the best hosting service on the planet. Favorite thing about M5: My co-workers! And the commitment to quality and doing things right. Sorry that’s more than one thing. Fun fact about me: I love languages! I recently spent three years in China learning Mandarin and teaching English and German. I have also studied Japanese, Arabic, and Esperanto, but I can’t really speak any of those (yet). Outside of work you’ll find me: Speaking different languages and seeking adventures, mostly of the food and travel sort. Now: Providing stellar support to our customers for their unique technical needs. Favorite thing about M5: Mountains of hardware and bandwidth to utilize for projects of curiosity or education. Fun fact about me: I have a hilarious dog named Bash. Outside of work you’ll find me: Patching synthesizers instead of computers. Then: Previous work includes Associate Editor at GameSpot.com and later an Associate Web & TV Producer for TechTV (CNET). Prior to my arrival at M5, I was living a rock and roll dream, touring and recording as a drummer/guitarist, and working for Revolver USA, a large indie record distributor. Now: At M5, my daily tasks require a working knowledge of operating systems (Linux, BSD, Windows), data center operations, cloud orchestration, hypervisors, network appliances (routers, switches, firewalls), network protocols (IPv6, IPv4, SNMP, etc. ), servers and related hardware, and shell scripting. Favorite thing about M5: My co-workers! Fun fact about me: I can juggle. Outside of work you’ll find me: Slapping on a Cajon (a six-sided, box-shaped percussion instrument originally from Peru). Then: Graduated from UC Santa Cruz. Volunteer for a gaming event for all things: sound system, mix live music, artist relations, customer service, set-up and check-in. I also was a student tutor. My first exposure to computers was in 1985 when Nintendo hit US stores. My first family computer was a 286 IBM PC Compatible. Now: Hosted Server and Cloud Instance Support. Favorite thing about M5: I was a client of M5 before being an employee. Coming to the inside was better than I imagined. It is the right place to be for a technology enthusiast. Fun fact about me: I enjoy free software as in freedom and as in beer. Outside of work you’ll find me: Gaming, building PCs from parts, enjoying all that San Diego has to offer, and playing or watching music. Then: With 15 years of IT Related Experience Specializing in VOIP and Telecommunications requiring me to travel to 10 countries in recent years. Now: Dedicated Server, Colo and Cloud support for the graveyard shift. Favorite thing about M5: I just started at M5, but I am looking forward to learning all kinds of new stuff. Fun fact about me: I’m a Motorhead, and Motorbike Enthusiast. I could Disassemble a Diesel Engine and put it back together and make it work (on a weekend). But usually you’ll find me in the kitchen baking up a storm. 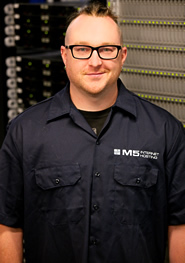 Then: Before joining M5 I had 11 years of experience in customer service and front-line critical infrastructure monitoring with various Internet Service Providers and Data Centers in San Diego. Now: Building, testing, and above all, doing whatever I can to help our customers! 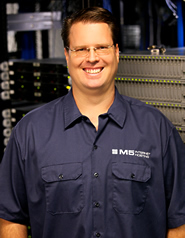 Favorite thing about M5: We’re a collection of geeks dedicated to doing things right, for our customers and ourselves. Fun fact about me: I’ve been active on the EFnet IRC network for over 20 years. Outside of work you’ll find me: In front of my computer! Gaming, on IRC, on reddit, or practicing some form of random geekery. Then: An orphan puppy in Mexico. Now: I greet the staff and visitors, control the mood and pursue crunchy things. Favorite thing about M5: I am the queen of the castle. 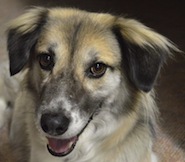 Fun fact about me: Because I was a rescued dog from Mexico, I can also bark in Spanish. Outside of work you’ll find me: Chasing rabbits, squirrels and birds and napping.